Photograph by Frederick Fiebig from an album of 70 handcoloured salt prints, showing a Buddhist temple in Sri Lanka (Ceylon). 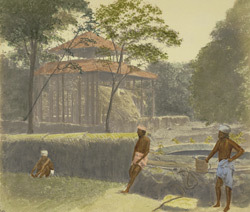 Little is known of the photographer apart from the fact that of German origin, he was an artist and lithographer in Calcutta, publishing a number of prints in the 1840s. He turned to photography in the late 1840s, using the calotype process and producing prints that were frequently hand-coloured. His photographs include hundreds of views of Calcutta, and views of Madras, Sri Lanka, Mauritius and Cape Town. The East India Company purchased a set of his hand-coloured views in 1856. The national identity and culture of Sri Lanka has been shaped by Theravada Buddhism, practised by its Sinhalese majority. Sri Lanka has the longest continuous Buddhist history in the world. Buddhism was introduced here in the 3rd century BC by a mission sent by the great Indian emperor Asoka, led by his son Mahinda. It was in Sri Lanka that the Theravada canon, previously orally transmitted, was written down in the 1st century BC, forming the sacred texts known as Tipitaka. A branch of the bodhi tree under which the Buddha attained enlightenment was brought here by Mahinda's sister, the nun Sanghamitta, and the tree descended from it is still venerated in its shrine at Anuradhapura.